SEVENTH CENTRAL PAY COMMISSION’S RECOMMENDATIONS — REVISION OF PAY SCALES — AMENDMENT OR SERVICE RULES/RECRUITMENT RULES. Sub: Seventh Central pay Commission’s recommendations — revision of pay scales — amendment or Service Rules/Recruitment Rules. The undersigned is directed to refer to this Department’s 0M or even number dated 9th August. 2016 the subject mentioned above wherein it was requested that as per the CCS (Revised pay) Rules, 2016 issued by Department or Expenditure vide Notification dated 25th July, 2016, consequential amendment in the existing Service Rules.’ Recruitment Rules shall be made by the Ministries/Departments by substituting the existing pay Band and Grade pay by the new pay “LEVEL in the PAY MATRIX” straightaway without making a reference 10 the Department of Personnel and Training Public Service Commission (UPSC). 3. 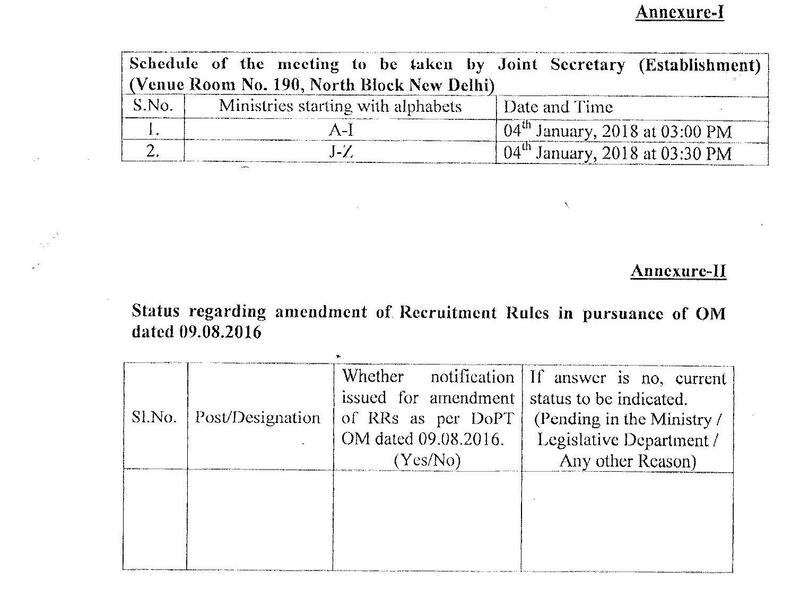 All Ministries/Departments are requested to furnish a status report regarding amendment Of Recruitment Rules in pursuance of DoP&T 0M dated 09/08/2016 in the annexure-Il enclosed herewith. The schedule or the meeting is as per Annexure-I.